I have been tryhing to get Bill Inkol to share a few of the wonderful stories of his experiences during a career in sports broadcasting that spans over 40 years. Below is one of many I hope he will send to the site! From Bowling For Dollars to BlueJay Banter, from Olympic broadcasts to Local Sports, he's "been there, done that" and along the way has met, and worked with, the major sports personalities of our time. "The news that Balsillie created when he tried to buy the Pittsburgh Penguins, jogged my memory back to the late 70's when four of us went traipsing down to Buffalo, intent on talking the owner of the NHL Kansas City Chiefs to relocate in KW. Plans were discussed to lift the roof of the Aud and put in 5,000 more seats and failing that, build a new Arena on city land near Freeport. That died when Harold Ballard phoned me and said there was absolutely no way we would get a team to infringe on his territory and I should do something to myself that I muttered was anatomically impossible. Failing that his Lawyers would be in touch. That will show that we were decades ahead of our time. There are other stories from the various olympics I was involved in that could be interesting as well. If that's O.K. I'll write something for you, only because you're a Senior and for no other reason!" Bill Inkol, a former news and sports reporter, tells the story of being on loan to the national network for the 1976 Montreal Olympics. In the course of events, Bill happened to strike up a conversation with actor Paul Newman and his wife Joanne Woodward, in town to enjoy the Games. After a moment or two Bill noticed a young couple glancing their way. After a minute of obvious deliberation the couple stood up and began, hesitantly, to move toward them. Bill then says to Mr. Newman and his wife that they've likely been recognized by some fans, and that they're on the way over. But when the couple got close they walked right past the Newmans and said to Bill, "Excuse us, but aren't you the host of 'Bowling for Dollars'?" Dan, Hello again. I just figured this thing out. Where's Ross Marshall, Bill Inkol, Don Cameron, John Larke, Grant Hoffman, Ron Roberts. I was at CHYM 65 to 68 and remember you well Dan. My real last name is Roberts. In 65 when I came to CHYM, station owner Don Hildebrand, was concerned about our listeners confusing my name Roberts with Ron Roberts, so we changed it to Shannon. Now, years later, when I became a tv news anchor in Columbus, Ohio, there was a guy named CANNON on local radio, bosses thought Shannon would be confused with Cannon so I went back to Roberts. Probably not interesting to you or your readers, but anyhow. Another name gamer for you. When my son was born in Kitchner in 1966, I couldnt think of a name, so Sandy Hoyt , our PD suggested Shannon, so we went with that. I loved Kitchener and Canada, but hated the weather, and when Hildebrand gave up the station, I came home to the States. But, Dan, I do recall, I called you about a job. Had you hired me, I might still be there. Anyhow, came home, spent years in radio til 76, then got into tv. Enough already. Any you guys and gals remember me, PLEASE write. Retired and living near Dallas, TX now. Larry Shannon ( Roberts) One more story. In 65 on my first day, a good looking woman walks into the lobby.. I asked Don Cameron, "who's that nice looking sack of potatoes".. he says, "that's my wife". Remember that one, Don? Was spending some time in your website and was interested in the CKKW history and saw the name of Sharon Hiltz mentioned. When I hit the airwaves for the first time, it was in Owen Sound at CFOS in March of 1959. (Holy cow...almost 50 years ago!) About a week after I went on the air, a young lady named Sharon Hiltz joined the staff and was involved in various departments, news, copy etc. When I left in 1960 to go to CKCR Sharon stayed but also went to Kitchener later to CKKW. After some time in Kitchener she went to North Bay. We kept in touch all these years and over the past year or so Sharon encountered some health problems. At the time they were somewhat minor setbacks. However a couple of weeks ago, her husband Bob wrote to tell me they couldn't save her in the North Bay hospital after she suffered a set back with an attack of her autoimmune disorder. It's a condition that occurs when the immune system mistakenly attacks and destroys healthy body tissue and in her case it was her liver. Sharon was a good friend, and while in Owen Sound, she was the very first baby sitter we had for our first child. As I said, that was almost 50 years ago. 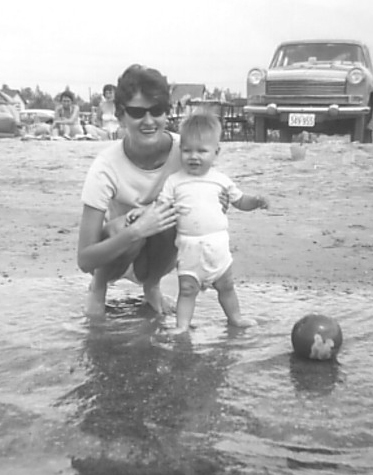 The attached photo shows Sharon and daughter Kathleen spending some time at Sauble beach in the summer of 1960. Thought you might be interested in some radio lore that unfortunately ends with an unhappy ending. Dan's Note: Sharon was an excellent copywriter at CKKW, she had a wonderful sense of humour and was a pleasure to work with.